You need the newest maps, the latest demographics, and the fastest, most intuitive Maptitude! 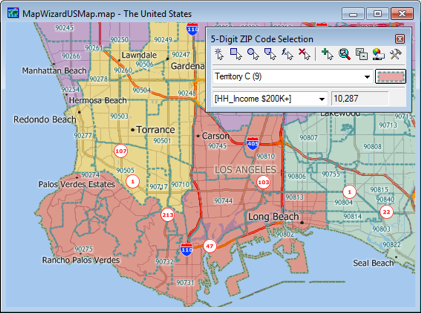 Maptitude 2013 is a major new release of Caliper Corporation’s popular GIS (Geographic Information System) and mapping software, which includes the most detailed and accurate data ever provided. Maptitude 2013 enables you to create the maps you need more quickly, with better accuracy, more attractively, and with the most powerful analytical tools available. The most exciting features of Maptitude 2013 are showcased below, while a complete description of the many improvements is available as a PDF here. Maptitude delivers easy-to-use, professional mapping tools at the affordable price of only US$695. Annual (optional) upgrades cost US$395 per user/license. For pricing and ordering information please visit the Mapping Software Store, e-mail Maptitude Sales, or call us at +1 617-527-4700. Maptitude 2013 ships with one detailed Country Package of your choice, and additional Packages can be purchased separately. Each Package includes a wealth of data unavailable in any other product, including an up-to-date street layer with addresses for pin-mapping (geocoding) and travel time information for computing routes and drive-time rings. Also included are building footprints for many urban locations, railways, and comprehensive named landmarks that range from public facilities to commercial buildings including shops, restaurants, and retail stores. Postal data and detailed demographics (where available) are shipped with the product. A basic global map is provided with every Maptitude license. This has been updated for country boundaries, provinces, and populated places. 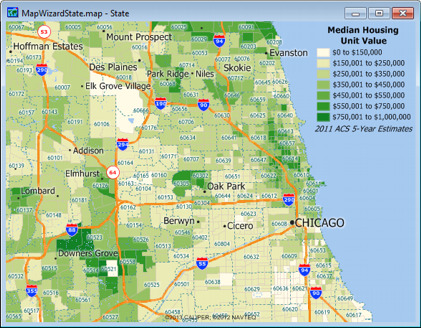 New U.S. data sets provide access to up-to-date geographic information. Maptitude now includes an October 2012 NAVTEQ® map, allowing accurate address locating and street visualization, plus robust data on which to calculate best route shortest paths, drive-time zones, and drive-time territories. An October 2012 NAVTEQ map is included in the Australia, Brazil, Canada, and United Kingdom Packages, as are the new 2011 Census data and map layers for each country (excluding Brazil). For additional information on each Package, including those for countries not mentioned here, please visit the Included Mapping Data page. In Maptitude 2013 it is much easier to manage territories. For each territory you can view demographic totals (e.g., high-income earners) and a count of the number of combined zones (such as Postal/ZIP Codes). In addition, there is control over the toggling between territories of your zones, allowing you to manage territory overlap. The drive-time rings that are produced by Maptitude are the most accurate of those in any mapping software, and take into account individual streets in the calculations of those locations that can be reached within the time or distance specified. Maptitude 2013 supports layer conversions to Google Earth Documents (*.kml,*.kmz) via Tools-Export. Maptitude supports date and time field types natively and in external data sources such as dBASE, Excel, Oracle, SQL Server, and in any ODBC compliant database. Maptitude 2013 supports the latest Windows operating systems, file types, and common design elements. Maptitude 2013 runs as a 32-bit or 64-bit application on 32-bit or 64-bit Windows 8, 7, Vista or XP. The many advantages of a 64-bit Maptitude include: the ability to save to much higher resolution images; the capability to use more memory than the previous 4GB 32-bit limit; and being able to open/import files via 64-bit Microsoft Office (e.g. Excel and Access). Click here to see features that were new to Version 2012.